Many protests, vigils and marches were held to protest the horrendous massacre of nine Black people in Charleston, S.C., on June 17. Below are reports from activists who participated in a few of them across the country. 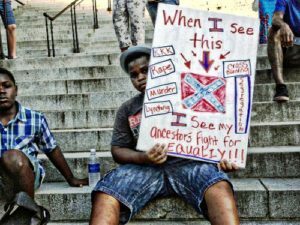 South Carolinians responded to the racist massacre in Charleston with a renewed fight to remove the battle flag of the Confederacy from the grounds of the State Capitol in Columbia, S.C. 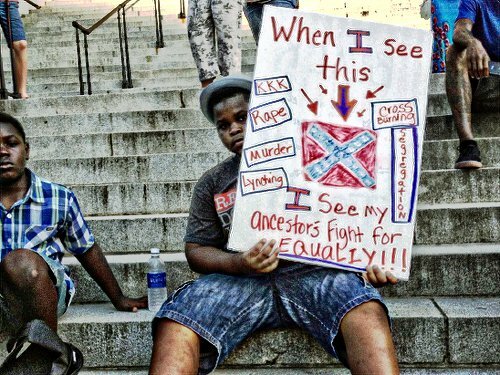 The presence of the slaveholders’ war flag and Confederate memorial belied the public grief affected by right-wing Gov. Nikki Haley and the state’s Republican power structure for the martyrs of Charleston. The flag is but one of many monuments glorifying the Confederate slavocracy across this city and state. On June 20, at least 2,000 people — Black, white, Native and Latino/a — filled the Statehouse grounds in 100-degree heat to demand the flag’s removal. The rally was built on social media in a few days. Organizations calling the rally included the NAACP and the South Carolina Progressive Network. 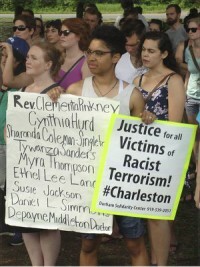 Speak out against Charleston massacre, Long Meadow Park, East Durham, N.C., June 20. On the night of June 21, pro-freedom activists painted “Black Lives Matter” and “This is the Problem #Racist” on the base of a Confederate war memorial in Charleston. Downtown rush-hour traffic in Newark, N.J., on June 19 saw a strong rally denouncing racism and the murders at the Emanuel AME Church in Charleston. Promptly called by the People’s Organization for Progress, the late afternoon rally had multinational speakers from three religions, introduced by POP Chairperson Larry Hamm. As many supporters gathered to denounce the murder of the Emanuel 9, passing drivers honked in solidarity. One speaker raised the racist nature of murders that loved ones had suffered in New Jersey as well. POP has called “A Million People’s March Against Police Brutality, Racial Injustice and Economic Inequality” on July 25 to counter this starting at noon from the Lincoln Monument. 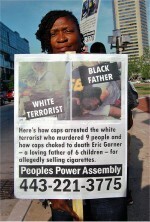 The Baltimore Peoples Power Assembly and the Baltimore chapter of the Southern Christian Leadership Conference called a rally and vigil in Baltimore to address the “War on Black America, from Baltimore to Charleston” on June 19 at McKeldin Square, where most of the Black Lives Matter protests have taken place. 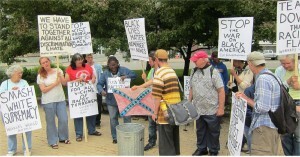 The rally was in response to the racist massacre and the continued police killings of Black people across the country. A multinational crowd came out in solidarity with the victims of racist terror. Emceed by the Rev. Cortly C.D. Witherspoon of the SCLC, the rally began by calling out the names of the nine victims. 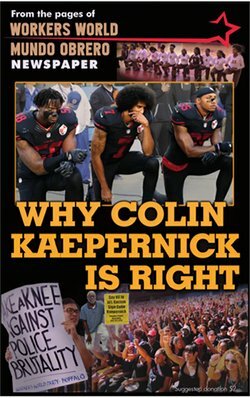 Lee Patterson, of Workers World Party, raised that racism isn’t about misguided individuals but rather is a product of the capitalist system, which keeps workers divided to maximize profits. Sara Benjamin of the PPA encouraged the crowd to attend activities on June 20-21 to remember Black girls and women victims of police terror. Other speakers included representatives from Rev.com, Afro-American Organization of Unity and Fight Imperialism, Stand Together. Prior to the horrific murders in Charleston, a press conference had been planned in Philadelphia on June 20 with Larry Hamm to announce POP’s march on July 25. 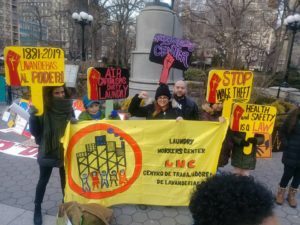 Close to 100 people attended the event, including Latino/a activists, white youth, Pam Africa, Ramona Africa, and militant Black activists in the Coalition for REAL Justice. Mothers of three victims of police brutality in the Philly area — Delphine Matthews, Ikea Manning and Tanya Brown-Dickerson — spoke, as well as members of the United National Antiwar Coalition and the International Action Center. Gabe Bryant, a REAL member linked with the Malcolm X Grassroots Movement, gave a moving account of the life of one of the elder victims, who at 87 had survived decades of racist attacks and historic struggles. A group of Dominican youth of Haitian descent on their way to picket at the Liberty Bell joined the event and spoke of horrific conditions for Haitians in the Dominican Republic. Younger participants decided to lead a five-mile march through the Black community, with the dominant chant “Justice for the 9 from Charleston.” As the march went into the community, it stopped at several key intersections where impromptu rallies were held, with neighborhood people listening to the raps of Coalition leaders. While the impact of the march was very powerful there, the response was positive everywhere. The Buffalo Anti Racism Coalition held a rally and speak-out in solidarity with Charleston on June 21 in downtown Buffalo, N.Y. Demanding that the racist Confederate flag be taken down, the group set that hated rag on fire and chanted “White supremacy’s got to go!” Activists from different struggles, including from Workers World and the International Action Center, spoke out about the causes and impact of racism on the lives of the oppressed and about organizing locally to fight back. A number of vigils commemorating the victims of Charleston’s racist massacre and expressing solidarity with Charleston’s Black community were held in the California Bay Area. Both the University of California Berkeley Black Student Union and the Allen Temple Baptist Church in Oakland held vigils on June 18. Students and other supporters also conducted a march after the Berkeley vigil. There was also a vigil in San Francisco’s Bayview district the next night. 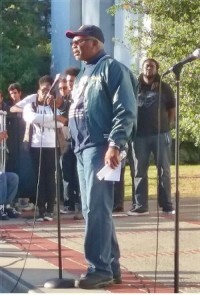 Clarence Thomas at Berkeley, Calif., vigil. A United Hood March in Seattle protested the South Carolina massacre on June 19, Juneteenth, the date of Texas’ emancipation from slavery. The march began at Seattle police headquarters and marched all over downtown chanting “Black Lives Matter.” The 200 marchers then held a rally at Myrtle Edwards Park at the waterfront. Called to show organized resistance to racist violence, it was also held to unite the community, including gangs that have often suffered the most from racist imprisonment and brutality. Contributors to this article included Bill Starr, Anne Pruden, Steven Ceci, Betsey Piette, Ellie Dorritie, Beverly Hiestand, Terri Kay and Jim McMahan.